It sounds wrong, but Corn Ice Cream is popping up everywhere from celebrity chefs to foodie magazines. Sweet corn ice cream is really delicious. Our version is made from fresh corn and includes almond butter toffee to give it a “caramel corn” flavor and crunch. Corn is at peak – so now is the time to try it! Pick up some farm fresh corn and cream to make a batch today. Preheat the oven to 350 degrees. Line a 1/4 sheet pan baking sheet with parchment paper. Spread almonds in an even layer on the parchment paper on the baking sheet. Place into oven and bake until they smell toasted and are lightly browned, about 7-8 minutes; set aside. In a medium saucepan melt butter over medium heat. When melted, add the sugar, vanilla, and salt. Cook, whisking until the mixture turns brown and reaches 300 degrees on a candy thermometer, about 10-15 minutes. Immediately spread the hot candy mixture evenly over the toasted almonds in a very thin layer. Be quick, it sets up fast. Let cool completely for about 2 hours. Break the almond toffee into very small pieces and keep in an airtight container. Toffee can be made the night before but be careful. It’s so good it could disappear by morning! Using a large knife, slice the kernels off the cobs and place in a large saucepan. Break the cobs in half and add them to the pan along with the milk, cream, and 1/2 cup of the sugar. Stir to mix well. Bring the mixture to a boil, stirring, and then remove from the heat. Cover and set aside for one hour to infuse the corn flavor into the liquid. Remove and discard the cobs, pour the mixture through a fine mesh strainer into a clean bowl, pressing on the solids to remove as much liquid as possible. Discard the solids. Turn the heat back on, pour the cream mixture into a clean sauce pan. Bring the mixture back to a simmer, remove from the heat. In a small bowl, whisk the salt, egg yolks and remaining 1/4 cup of sugar. Slowly add a cup of the hot cream mixture to the yolks, stirring constantly so they don’t curdle. Add another cup or two, stirring constantly to temper the eggs. Add the yolk mixture to the rest of the cream mixture in the saucepan, stirring. Cook over medium-low heat, stirring constantly with a wooden spoon, until thick custard forms. It should be thick enough to coat the spoon, about 10 minutes. Remove from the heat. Set aside a larger ice filled metal bowl with a medium metal bowl fitted inside it over the ice. Set another fine sieve strainer over the medium bowl. Pass the custard through the strainer into the cold bowl. Discard any remaining solids. When the custard is cool, cover tightly and refrigerate over night or at least 6 hours. Freeze in an ice cream maker according to the manufacturer’s directions. At the end of the freezing cycle add the finely chopped butter toffee. 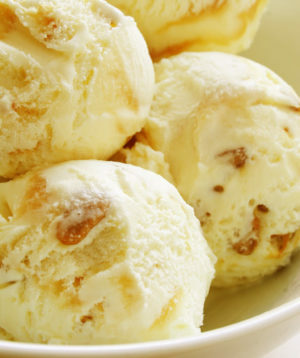 Place the ice cream in a tightly covered container in the freezer and freeze for 2 hours before serving. Delicious blueberries are at their peak right now. Our cake recipe is loaded with fresh berries and flavored with a walnut cardamom topping. Perfect with just a cup of coffee for breakfast or as a dessert. Add icing as a special treat by combining 1 cup of powdered sugar with 1 tablespoon of fresh lemon juice. Then whisk until completely smooth. Lightly drizzle the icing over your cake right before serving. Preheat the oven to 350 degrees. Butter and flour an 8×8 inch square baking pan. Place the walnuts on a sheet tray and toast in the oven for 10 minutes; remove from the oven and cool. Leave the oven on. Put 5 tablespoons of butter, ¼ cup sugar, ⅓ cup dark brown sugar, ⅓ cup all-purpose flour, ¼ teaspoon of salt, and ½ teaspoon of ground cardamom in a food processor and pulse just until the mixture forms large clumps. Scrape into a bowl, stir in the toasted walnuts. Cover tightly and refrigerate. 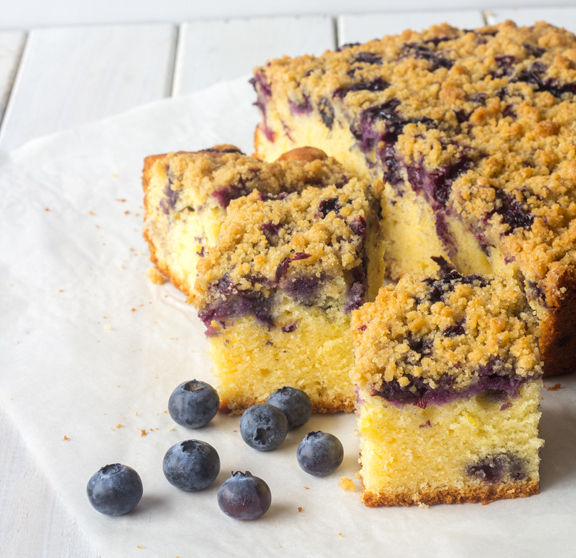 Gently toss the blueberries in 2 teaspoons of the flour to coat; set aside. Whisk together the remaining 2 cups flour, the baking powder, baking soda, salt, cinnamon, and ¼ teaspoon cardamom. Set aside. Into the work bowl of a stand mixer add the remaining 6 tablespoons of butter. With the paddle attachment beat the ⅔ cup sugar at medium speed for 3 minutes or until light and fluffy. Add the eggs one by one, beating for about 1 minute after each addition, then beat in the vanilla extract. Reduce the mixer speed to low and add the flour mixture and the buttermilk alternating between the two, beginning and ending with the dry ingredients. Blend just until you have a thick, creamy batter; do not over mix. With a rubber spatula, gently stir in the flour coated berries. Scrape the batter into the buttered pan and smooth the top gently with the spatula. Using your fingertips, break the topping into pieces and scatter over the batter, gently pressing them into the batter. Place in the oven and bake 55 to 65 minutes, or until a knife inserted into the center of the cake comes out clean. The topping should be nicely browned. Cool before serving. You can serve this cake warm or at room temperature. 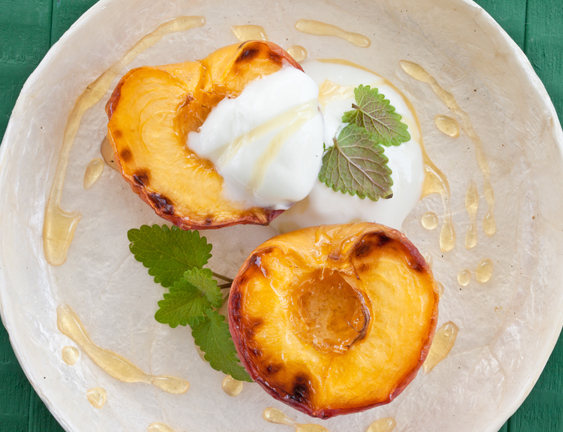 The smokey essence of grilled peaches goes perfect with bourbon and vanilla. There is no better combination for a summertime dessert on a hot July night. Stir milk, cream and brown sugar in saucepan over medium high heat until comes to rolling boil. Whisk yolks, sugar and salt in a medium bowl until pale yellow and sugar is dissolved. Place medium metal bowl in a large bowl of ice water to chill. Set with fine mesh strainer. Add hot cream mixture to egg yolks gradually, whisking constantly. Return to pan and cook over low heat until nappe (coats the back of a spoon). Strain the custard into the chilled bowl. Cool, stirring occasionally. When cooled, add the vanilla extract and bourbon, then cover and chill overnight. Freeze in an ice cream machine following the manufacturers directions. Preheat grill to medium-high heat. Cut peaches in half and remove the pits. Brush cut side with grape seed oil. Place peach halves cut side down on grill. Grill for about 3 minutes. Turn and cook for another 3 minutes. Serve with Bourbon Vanilla Ice Cream.